Speaking of James Bond… Here’s a version of “Goldfinger“. 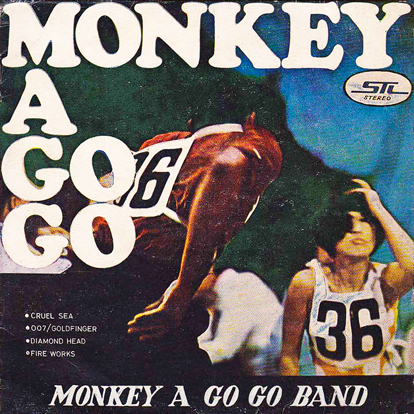 Now, there never was a band called ‘Monkey A Go Go Band’. The origin of this single is pretty sketchy, since there is no information on it what so ever. I believe it was manufactured in either Malaysia or Hong Kong. But the cover happens to look a whole like Takeshi Terauchi & His Blue Jeans’ album “モンキー・ア・ゴー・ゴー!” – which translates as “Monkey A Go Go!“. And, what do you know? All of the songs on this single happen to be on that album. Catalog number EPS 201 on STL Records. No other information available.